Today Thanksgiving arrives for me in Germany.Â And if I only paid attention to my microcosm of a world here in the Rheingau, it would pass just like any other Thursday during the fall.Â I had class from 1pm to 9pm today.Â I am preparing for two final exams next week, as well as finishing work on a term paper and a presentation in German.Â If it was not for my contact with the states and my own internal clock, I would have had no idea I was in the midst of a holiday I would have celebrated eagerly any other year. But the fact that I am American causes me to miss my family and friends on this particular seemingly normal day.Â Fellow Americans here wish each other a Happy Thanksgiving, but it still does not truly register.Â Normally I would be eating a lot with extended family as most Americans do, and I would have run in a Thanksgiving 10K race this morning in Cincinnati, as I do most Thanksgivings of late.Â This year it was the 100th anniversary of this race, the eldest one on Thanksgiving Day in America. But instead I am in a new situation.Â So, I can do one of two things.Â As most Americans here and elsewhere abroad have a tendency to do, I could gripe about missing home.Â I could complain that I am missing the company of family and a feast.Â However, in so doing, I believe I would be utterly insulting to the spirit of the holiday. Thanksgiving is a time to be thankful for what you do have, rather than miss the things you do not.Â This year I had the chance to take an incredibly cool trip to the other side of the world.Â And I do not see how I can take on something so great as this opportunity, and at the same time complain that I cannot take part in this holiday.Â I would feel like a hypocrite.Â You cannot have your cake and eat it too; God does not give anyone two cakes. So today I am thankful for many things.Â I am thankful for friends and family, and also for the gift of being alive.Â I am thankful that technology in this age affords me to Skype with my family while they feast.Â I am also of course thankful to the faculty of the University of Louisvilleâ€™s College of Business for arranging this endeavor, as well as to the benevolent family which made this trip financially possible.Â I would be remiss if I did not take heart in these blessings and only concentrated on my separation from Kentucky. Furthermore, I believe that today I am acting more in the true spirit of Thanksgiving than any other year.Â The first Thanksgiving was about journeying to a different world and starting something different.Â The original Pilgrims were away from family.Â If they spent that time feeling sorry for themselves there would never have been a Thanksgiving.Â Instead, they thanked God for a good harvest and a prosperous year and ate a lot.Â And thus, so will I. Happy Thanksgiving to those in the USA! Yesterday news broke out that the European Auto-maker, Opel, a division of GM, will not be sold by the American Automotive giant.Â I found this to be especially interesting news, as an American currently residing in Opel’s home state of Hessen, Germany.Â Their headquarters in RÃ¼sselsheim are a mere 30 minute drive from my flat.Â General Motors cited Opel’s significance in its future global strategy as a key reason to reject a potential sale to a Canadian or Chinese company.Â According to Reuters, Opel held a 7.2% share in the European automotive market in August. This represents the strength of the future plans for GM, and it’s confidence in the future American and world economy.Â President Obama’s administration released a statement saying they had nothing to do with the decision not to sell, despite the US Treasury having an approximately 60 percent share in GM after all of the government loans to keep the company afloat.Â Hopefully this and recently reported profits in Detroit will spur more positive action in the US stock market. Conversely, German politicians, are more than irked in general about this announcement.Â Angela Merkel, current German Chancellor, was taken aback by this surprise move by GM.Â Juergen Ruettgers, the Minister-President from the neighboring state to Hessen, North Rhine-Westphalia, stated that “General Motors’ behavior shows the ugly face of turbo-capitalism…”Â It is possible that they have doubts about GM’s abilities to procure funds to keep its European units stable. In contrast, at Vauxhall in Britain, GM’s other big European operation, workers and community members were relieved to hear that the Detroit company was not going to sell.Â GM has stated, however, that these plans do not affect its current intentions to unload its Saab operations on a Swedish company. It is these German-American news stories, whether positive or negative, that make me happy to be abroad and learning about another country’s economic state.Â Other recent tidbits of information that I have learned about my current state of residence include that it is where the element Hassium was discovered less than twenty years ago (and named for, despite a slight spelling change).Â Hessen is also famous for being the home of the best German wine, from the Rheingau region.Â I live dead center in the middle of this German anomaly: a region so enamored with wine in the middle of a country so reknown for its breweries.Â And naturally, although I have admittedly not thought a lot about specific American historical events since middle school, Hessen is the origin of the famous Hessian mercenaries which George Washington crossed the Delaware to surprise attack on Christmas Day during the American Revolution.Â Without these men we as Americans would be without one of the most iconic American paintings.Â Ain’t history great? Google Wave Preview – Worthy of a Look? Instead blogging about Europe and it’s intricacies and wonderments, I thought I would shift gears on this post. As a CIS student, I would like to implore you to try out Google Wave, a new and intriguing communication technology from one of the most innovative companies in the world. For anybody that does not know, Google Wave was announced in late May at the Google I/O conference. You can watch the 80 minute video where they introduced the technology here. Or for those without an outrageous amount of time and interest, you can just watch the first 2 minutes, and say you saw the whole thing. The video is quite a la Steve Jobs and his clichÃ© presentation style, only geekier and with worse jokes. 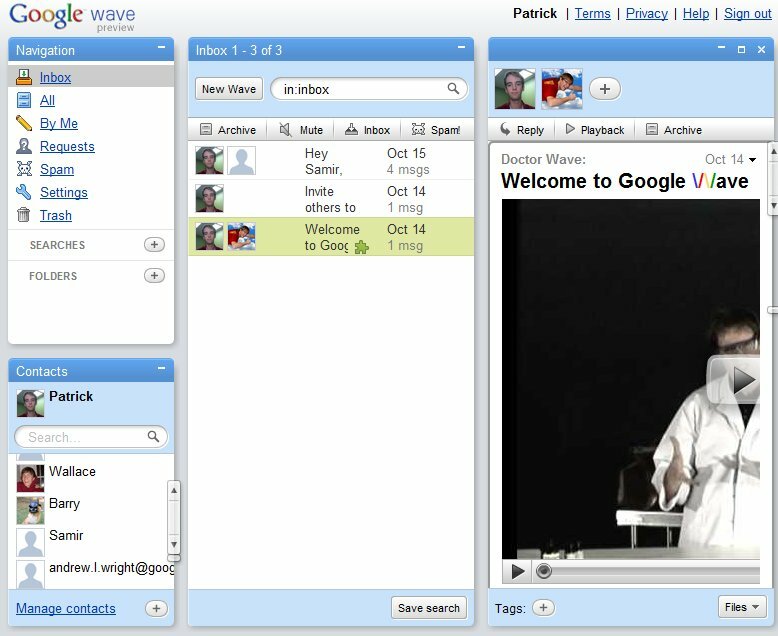 Wave, as the video tells, is Google’s reinvention of the concept of an email, if it were possible to completely remake it today. Daniel Lyons from Newsweek explains that “Wave combines e-mail, instant messaging, and word processing and editing; plus, you can upload and share photos, videos, and other media.” The emphasis is on the conversation, or a “wave” between two or more people. Other people can be added to the wave, and use the “playback” feature to run through the entire conversation so far to catch up. They use features of HTML 5 to make it a very feature filled utility. It also has instant messaging capabilities, which allows faster communication than a regular email conversation and maximizes your time usage. All this is available on Google Chrome, Apple’s Safari 4, Firefox 3.5, or IE if you use a Chrome plug-in. Over the summer, selected developers were allowed to explore the Google Wave system. This was a move to encourage them to program extensions for the utility before it actually comes out fully for the public. Now, since September 29th, Google has released a “preview” version of Wave to a select amount of the public. So, if you visit wave.google.com, you can apply for an account. In my own case I received one about one day after I applied. Be aware, though, that since it is a preview there are a number of features disabled as Wave is a work in progress at the moment. You can check out the Wave developers’ blog for information on how it’s coming along. I want to warn anybody not particularly interested in new web technology that getting an account at this point is probably a waste of time. While you can use Wave for communication today, there are obviously not a lot of people with accounts, so it will not be a viable option if you are looking for an email or IM alternative immediately. Google’s launch of the full product is supposed to be in the first half of 2010. You should only check this out if you are interested in seeing what the future of web communication might be like. Whether or not Google Wave takes off remains to be seen, but there is no doubt that future communication will be built upon ideas like this. Last weekend I had the opportunity to participate in an international event of rare quality: the Berlin Marathon. This event, over the course of the weekend, caters to just under 50,000 athletes from 122 countries. Most of them are in the capstone race, which is the 26.2 mile marathon that takes place on Sunday morning. It is part of the most prestigious series of marathons currently: the World Major Marathons. One of the most fascinating points about the race is not only that it introduces history to a runner the way only a marathon can, but also that the race itself is a part of history. Before the reunification of Germany in 1990, the race course was only in West Berlin. The only way an East Berlin runner could participate was to sneak to the other side of the Wall. So many people in the East crowded the top of the Fernsehenturm (TV Tower) to watch the race from the East side in the 80’s that it had to be closed during the race in ’87 and ’88. In 1990 the marathon was held on September 30th, while the official reunification of the country was to take place on October 3rd. The race director, in a wise move, was able to allow the race to flow through the Brandenburg Gate for the first time ever to the East side. Because this race actually occurred before people were allowed across, registration was flooded that year. In 1989 16,410 people ran, but in 1990 they had to limit the influx of entries to an astounding 25,000 who were eager to be apart of history. That year and the city’s history make the race the world class event it is today, which attracts the most elite athletes the world has to offer. Today the race crosses between East and West Berlin four times, including the most prominent one, through the Brandenburg Gate, 400 meters from the finish line. In the end, I ran a 3:15, good for 2,581st place. Not my best performance in a marathon, but what was supposed to be my peak training days for the race were spent backpacking across the Mediterranean area. The lesson for the trip, however, is to make sure you have a seat reservation on the train out of a city after a marathon. I neglected to have this foresight, and had to spend the duration of the trip in the gangway between cars. Leg cramps abounded, but life goes on still. Since this is my first blog post for the business school, I’ll start by introduce myself.Â I’m a 21 year old Computer Information Systems major from Edgewood, KY (a town in the middle of Ã¼ber-suburbian Northern Kentucky).Â I am studying in Oestrich-Winkel, Germany at the European Business School for the duration of fall 2009.Â Why did I chose to study abroad?Â Originally, to figure out if I should, I asked myself the inverse question: “Why not?”Â Since there were no outstanding reasons why not and way too many reasons to do so, I chose to look into options to study at a partner university.Â To bolster our experience, my friend at U of L’s business school, Joe Huber, and I traveled around a large chunk of the Mediterranean Area for three weeks prior to arriving in Oestrich-Winkel.Â For a verbose and extensive chronicling of that adventure, see Joe’s first post on this site.Â I will not repeat his thoughts on the experience as mine are much the same, but I may write about random revelations on the experience in a future post. So this brings me to the subject of this post: my experience with the German language.Â Thus far, I have only taken German 121, or the introductry semester in the language at Louisville.Â This class and it’s exceptional teacher (I have to mention Monica Krupinski. )Â gave me a good basis.Â This class and the limited use of the Rosetta Stone products led me to believe that I could handle the basic level of the intensive German class that leads off the semester.Â (There are three levels: beginner, basic, and intermediate). Last week I realized that I was quite wrong in this assumption.Â On the first day the professor spoke 100% German and started issuing instructions for an assessment exam.Â The test might as well have fit the clichÃ© and been in Greek (and yes, we found in Greece that despite knowing the alphabet it does live up to the old adage as a very confusing language).Â My professor cracked jokes when the tape player that directed the listening portion of the test did not work initially.Â Most of the class laughed.Â I did not understand any of them. The process of learning a language is a slow one.Â Through some miracle, I was not dropped to the beginner level after that first test, so it appears my German was not quite that horrible.Â The first day of actual class I understood only an odd word here or there that my professor said.Â I thought of asking to go back to the beginner level.Â Two of my classmates in fact did very quickly.Â I chose to stay and ride out the storm, since if I dropped down I knew I would not learn anything new at all.Â Luckily a Hungarian friend of mine who is quite proficient in English explained the particularly convoluted instructions. I just finished this Intensiv Deutschkurs this afternoon, so I can now look upon it with some very short hindsight.Â Although I still do not understand a lot of what the professors say, some of it does sink in slowly.Â The theory behind being taught entirely in German makes some sense because you associate new words with other German, rather than English or any other native language.Â However, if you do not have the basic vocabulary, it becomes quite difficult.Â Example:Â On the first day of lecturing I did not understand the word “sterben” and asked my professor about it.Â He started speaking about several synoyms, little of which I understood.Â I feared that without the basic vocabulary I needed, I could never learn new words.Â However, when he started to speak about the German word for death (Tod) and Michael Jackson, I caught the drift.Â And indeed, the word meant “to die”.Â It’s experiences like that make a word very easy to remember. Learning German outside the classroom is also an adventure.Â If you go up to any person in customer service and mumble something like, “Mein Deutsch ist nicht sehr gut…” (My German is not very good), most of them will launch into an English conversation with you.Â However, where is the learning experience in that?Â Sure, when I was in Turkey, Greece, or Italy I felt no guilt in having someone switch to English for me or use gestures to communicate, but the knowledge that I am in this country for an extended period of time motivates me to assimilate to the culture as quickly as possible. There are some small victories involved.Â I can go to the grocery store without incident (although there is little talking involved there with the cashier).Â Last weekend I got my haircut in the nearby city of Wiesbaden.Â None of the stylists spoke English.Â My German friend who attended the University of Louisville, Martin Weckenmann, in the spring left to get a beer across the street while he waited for me.Â I told him I would be alright.Â I am proud to say that I came out of that day with a haircut that did not resemble any sort of lawnmover accident.Â The process of learning a new language is a slow one, so just make sure that you have delved enough into a culture before you go anywhere near somebody with scissors.